Visit us to experience relief from your back pain. Chiropractic is a health care profession that focuses on disorders of the musculoskeletal system and the nervous system, and the effects of these disorders on general health. Chiropractic care is used most often to treat neuromusculoskeletal complaints, including but not limited to back pain, neck pain, pain in the joints of the arms or legs, and headaches. Doctors of Chiropractic – often referred to as chiropractors or chiropractic physicians – practice a drug-free, hands-on approach to health care that includes patient examination, diagnosis and treatment. 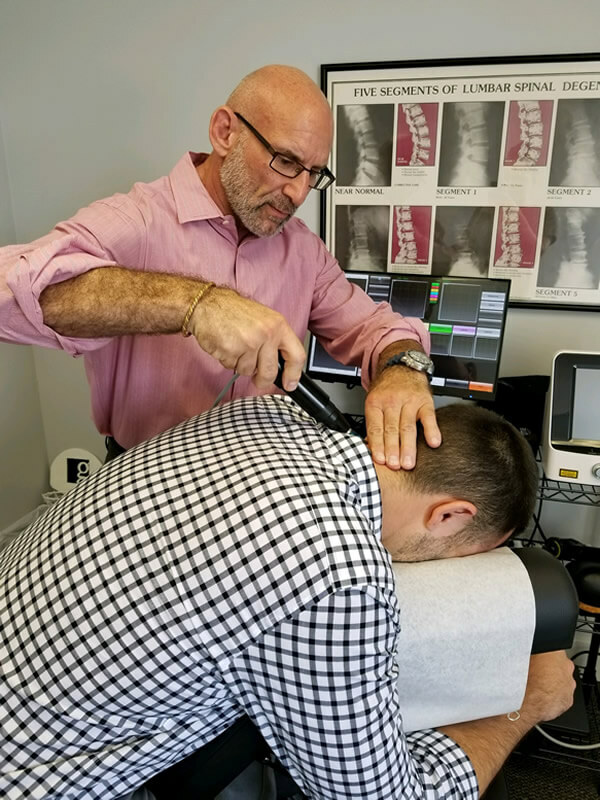 Chiropractors have broad diagnostic skills and are also trained to recommend therapeutic and rehabilitative exercises, as well as to provide nutritional, dietary and lifestyle counseling. The most common therapeutic procedure performed by doctors of chiropractic is known as “spinal manipulation,” also called “chiropractic adjustment.” The purpose of manipulation is to restore joint mobility by manually applying a controlled force into joints that have become hypomobile – or restricted in their movement – as a result of a tissue injury. Tissue injury can be caused by a single traumatic event, such as improper lifting of a heavy object, or through repetitive stresses, such as sitting in an awkward position with poor spinal posture for an extended period of time. In either case, injured tissues undergo physical and chemical changes that can cause inflammation, pain, and diminished function for the sufferer. Manipulation, or adjustment of the affected joint and tissues, restores mobility, thereby alleviating pain and muscle tightness, and allowing tissues to heal. Chiropractic adjustment rarely causes discomfort. However, patients may sometimes experience mild soreness or aching following treatment (as with some forms of exercise) that usually resolves within 12 to 48 hours. In many cases, such as lower back pain, chiropractic care may be the primary method of treatment. When other medical conditions exist, chiropractic care may complement or support medical treatment by relieving the musculoskeletal aspects associated with the condition Doctors of chiropractic may assess patients through clinical examination, laboratory testing, diagnostic imaging and other diagnostic interventions determine when chiropractic treatment is appropriate or when it is not appropriate. Chiropractors will readily refer patients to the appropriate health care provider when chiropractic care is not suitable for the patient’s condition, or the condition warrants co-management in conjunction with other members of the health care team.